The Silesia–Cracow district in Poland has been one of the world’s principal sources of zinc from nonsulfide zinc ore (Polish: galman). The still remaining nonsulfide ore resources can be estimated at 57 Mt at 5.6% Zn and 1.4% Pb. Nonsulfide mineralization is mainly hosted by Lower Muschelkalk (Triassic) limestone and is associated with different generations of the hydrothermal ore-bearing dolomite (OBD I, II, III). A fundamental ore control is believed to have been exerted by the basement faults, which were repeatedly reactivated during the Alpine tectonic cycle, leading to the formation of horst-and-graben structures: these dislocations may have caused short periods of emersion and the circulation of meteoric waters during the Cenozoic. Nonsulfide ores show a wide range of morphological characteristics and textures. They occur as earthy masses, crystalline aggregates, and concretions in cavities. Breccia and replacement textures are also very common. The most important mineral phases are: smithsonite, Fe–smithsonite, Zn–dolomite, goethite, and Fe–Mn(hydr)oxides. Minor hemimorphite and hydrozincite have also been detected. Two distinct nonsulfide ore types occur: the predominant red galman and the rare white galman. In the white galman, Fe–smithsonite and Zn–dolomite are particularly abundant. This ore type is commonly considered as a peripheral hydrothermal alteration product related to the same fluids that precipitated both the OBD II–III and the sulfides. In contrast, a supergene origin is commonly assumed for the red galman. Evidence of the petrographic and mineralogical difference between white and red galman is also found in stable isotope data. Smithsonite from red galman shows a limited range of δ 13CVPDB values (−10.1 to −11.4‰), and δ 18OVSMOW values (25.3‰ to 28.5‰, mean 26.8 ± 0.3‰). The uniform and low carbon isotope values of red galman smithsonite are unusual for supergene carbonate-hosted deposits and indicate the predominance of a single organic carbon source. Smithsonite from white galman has a more variable, slightly more positive carbon isotope (−2.9‰ to −7.4‰), but broadly similar oxygen isotope composition (26.8‰ to 28.9‰). The relationship of the white galman ore with the hydrothermal system responsible for OBD II and sulfide generation is still uncertain. The most important paleoweathering events took place in both Lower and Upper Silesia during Late Cretaceous up to Paleogene and early Neogene time. During this period, several short-lasting emersions and intense weathering episodes facilitated the formation of sinkholes in the Triassic carbonate rocks and the oxidation of sulfide orebodies through percolating meteoric waters. These phenomena may have lasted until the Middle Miocene. 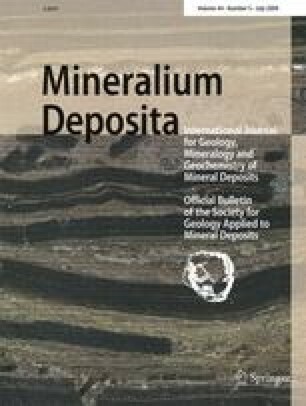 Without the help and guidance of the late Prof. W. Zabinsky of the Mining Academy in Cracow, this study would have probably never been initiated. We are also indebted to M. Szuwarzynski, H. Kucha, A. Paulo, and M. Krzak (Poland) for help and stimulating discussion. We would like to thank also the geologists of the Trzebionka and Pomorzany mines for having guided our team and for extra samples. V. Coppola wishes to thank R. Herrington and the staff of EMMA division at the Natural History Museum, London, for the analytical support during an ACCORD project. Special thanks is due to Bernd Lehmann and to an unknown referee for careful reviews and editing.